» Reviewed by Barry Gardner: ARTHUR LYONS – False Pretenses. Reviewed by Barry Gardner: ARTHUR LYONS – False Pretenses. ARTHUR LYONS – False Pretenses. Jacob Asch #11. Mysterious Press, hardcover, January 1994; reprint paperback, March 1995. 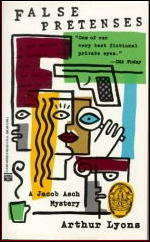 Arthur Lyons has been writing about Jacob Asch for 20 years now, which makes him one of the elder statesman among hardboiled PI writers still writing. Most would grant him a place in the top ten, and some higher. Asch is feeling middle-aged about it all lately, and has been reduced lately to certifying incompetents for conservatorships, so he welcomes the chance to follow a wife for a man who is suspicious of her. She does nothing off-key, but when he returns to his office he finds the husband dead in the chair behind his desk, his brains splattered all over the wall. He wasn’t who he said he was and neither was she, Asch finds as he begins to try to sort out what and why. While doing this he meets a statuesque LAPD Lieutenant, and this gives rise (pun intentional) to more complications. Lyons does the usual competent job of telling his first-person story, with minimum description and terse, no-frills prose. Asch is a bit more active sexually than I remember from past books, but otherwise is the same old lone wolf PI driving LA’s mean streets. Death Noted: ARTHUR LYONS (1946-2008). Includes a complete bibliography, with many cover images. Editorial Comment: This is the first time I’ve edited one of Barry’s reviews for this blog. The original final sentence seems to have referred to an ongoing apazine discussion of the “death of the PI novel,” but I couldn’t find the exact reference, nor I could I have repeated the entire conversation even if I had. So I replaced it by a single word [in brackets] which I hope expresses Barry’s displeasure at being disappointed by two of his favorite authors. For what it’s worth, and you can read into this whatever you wish, False Pretenses was the last of eleven books in Arthur Lyons’ Jacob Asch series. It was too bad the series ended with a whimper, so to speak. In the ealy to mid-80s Lyons was one of my favorite PI writers, way above Valin in my estimation. What these last couple of reviews by Barry go to show, though, is his honesty — no apologies for bad books by favorite writers — and his insight into what made a bad book bad. Around the late 1980s and early 1990s I was proclaiming the death of the Private Eye novel. I wrote about it in Bob Napier’s legendary Mystery Detective Monthly (MDM)and I went to EyeCon in Milwaukee to present my views on a panel with defender of the P. I. novel, Barry Gardner (refereed, literally, by Bob Napier). Subsequent events seemed to have proved me right. George, I suspect you are having fun with us claiming the P.I. novel is dead. Granted the amateur has become more common, but it has not replaced the P.I. completely. Writers such as Robert Crais, Tim Maleeny, Paco Ignacio Taibo II, and others continue to write using the standard P.I. Miss the old 1940’s brand. Have you read Kelli Stanley and Linda L. Richards female hardboiled dicks? The use of the P.I. in sci-fi and fantasy grows every day including writers such as Jedediah Berry, A. Lee Martinez and John Zakour. “According to a new book search tool on Google, we are currently living in a literary private detective renaissance. The new Google Books Ngram Viewer revealed that private detectives are mentioned in books now more than any moment in human history. I don’t know if George is having fun with us, or if he’s still fighting old battles and lost causes. Individual authors may burn out as they come and go, but as long as Sue Grafton, Sara Paretsky, Bill Pronzini and a number of others are around, including the ones Michael brought up, I think the PWA will hang around for a little while longer yet. Genres that are dead are gothic romances, regency romances, men’s adventure series, and on the verge, the the pulp adventure science fiction novel and (I do believe) the traditional western. In fact, I have a feeling that mass market paperbacks in general are about to swirl down the drain and fairly soon, but PI’s, in all kinds of guises, no not dead yet! I don’t know that any of those genres are really dead…well, maybe the western. Although Pronzini and Robert Parker attempted to revive it with a few modern contributions. I think you’d be surprised by the transformation of the romance market – which is alive and well in ALL its subgenres and still making millions. I know I was stunned by the number and variety (paranormal romance?!) when I was investigating selling books at a very odd (to me) Romance Writing convention. It’s very easy for anyone to say that the kinds of books they loved are long gone and dead but the publishing industry (what’s left of it) and new writers are constantly experimenting and transforming the “old and dusty” genre types. J.F., I favor e-books over print but I doubt print will disappear within this generation. E-books make up less than 10% of sales today. Today’s media seems to listen only to Chicken Little and the Boy that called Wolf. Look how slow newspapers are dying. Has the cellphone replaced the land phone yet? Has iTunes replaced CD? You still can buy LPs. I have grown weary of all these headlines with “death of print”, “death of kindle” etc. People like choice. Name anything that does not come in two or more different formats. The time to worry for your print books is when e-books make up 90% of sales and print 10%. BTW, I use my 27inch HD Mac to view my art books. Imagine those book covers at that size. E-books is just another format. Genres adapt. I can not tell you the number of times I have listened to people say the TV sitcom is dead or scripted TV is dead. Right now the science fiction fans are all doom and gloom as fantasy, especially urban fantasy, becomes more popular.